SSC Released Answer Key for MTS 2016 Exam, Candidate can raise issue. 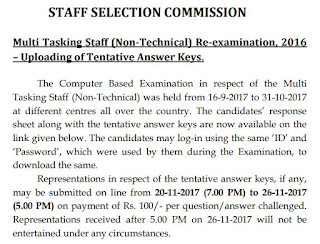 Staff Selection Commission(SSC) relased Answer Key for Multitasking Staff(Non-Technical) 2016. The Computer Based Examination in respect of the Multi Tasking Staff (Non-Technical) 2016 was held from 16-9-2017 to 31-10-2017 at different centres all over the country. 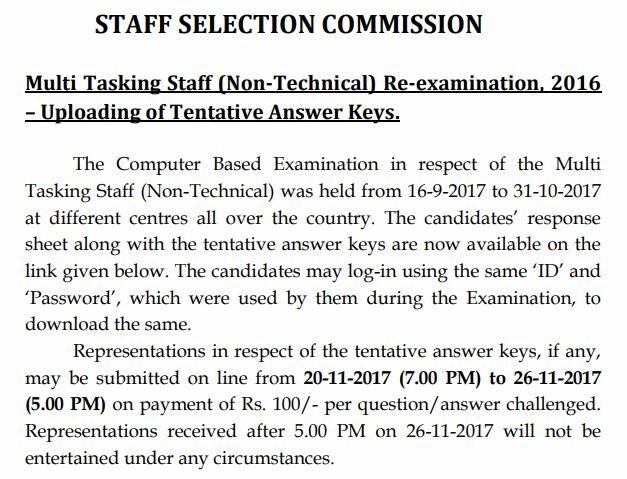 Candidate can check their answer key and If any objection over this tentative answer key, can raise their issue with a fee of 100/- from 20 Nov 2017 to 26 Nov 2017(5:00PM). Candidate can check thier Answer key from the link given below. They(candidate) have to Enter their roll number and Select Date of Examination to view thier Answer Sheet. To View Your Answer Sheet Click on the Link Given Below.